We’re all spending more time with smartphones and tablets. So much so that the “second screen” may now be the “first screen,” depending on the data you read. Mobile analytics and advertising firm Flurry released a report on Tuesday that says Americans spend close to 10 minutes more per day on mobile devices than sitting in front of a television. The report is a mash-up of mobile device usage from Flurry’s own analytics as well as comScore’s, and average TV usage from the U.S. Bureau of Labor Statistics. 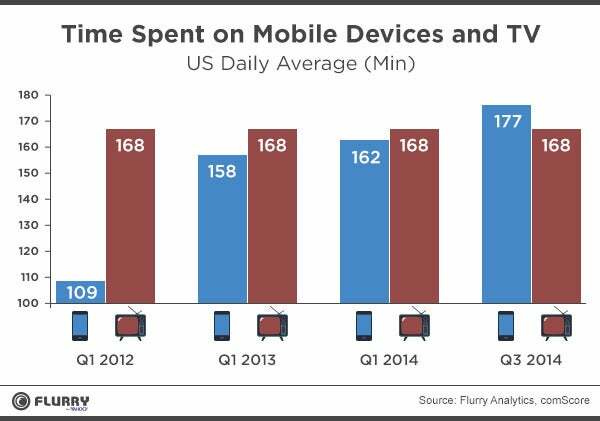 Flurry says Americans spend two hours and forty-eight minutes watching TV, while mobile device usage is now at two hours and fifty-seven minutes. Flurry’s latest report was inspired by a recent presentation by Benedict Evans, a partner at venture capital firm Andreessen Horowitz. The story behind the story: Flurry’s report, while interesting, works only if you buy into the BLS data, which is from a self-reported study called the American Time Use Survey. Numbers from metrics firm Nielsen tell a different story. 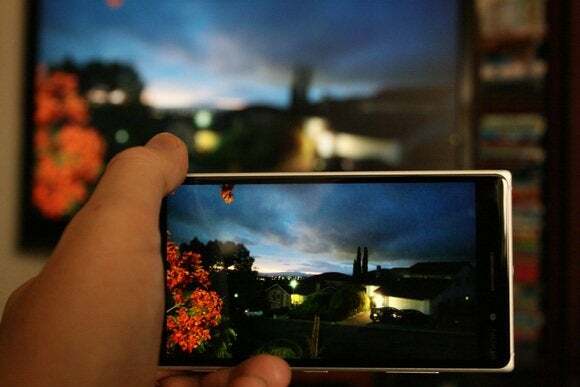 In September, Nielsen issued its cross-platform report for Q2 2014, which says American adults spent an average of four hours and thirty-six minutes watching live TV (on a television set) every day between April and June. One notable thing Flurry said it couldn’t measure was how much overlap there was between TV watching and mobile device usage on an average day. However the company guesses it’s a lot, which is probably right. Thinking about my own TV watching, I know I spend all kinds of time on my smartphone. I could be checking an actor’s name on IMDb, quickly responding to email, texting with friends, or browsing Twitter and the news if I lose interest with the bigger screen. Whatever it is I’m watching, my smartphone is always close at hand. Even if you put more stock in Nielsen’s numbers than the BLS stats, it seems inevitable that smartphones and tablets will replace the television in terms of time spent. Many metrics firms, including Nielsen, report on the rapid increase of mobile device usage—especially when it comes to apps. It also just makes sense. “As more consumers use mobile devices for almost every daily task, it seemed only logical that they would turn to their phones more often than their TV sets,” Flurry said in its report. If you need further convincing about the coming (or present) dominance of mobile devices, check out this data from a British survey published in April: Adults in the U.K. were asked which device they would miss most if they had to give it up. The older the respondents, the more likely they were to choose television as their most missed media activity, the survey said. For people between the ages of 16-34, however, the top choice was their smartphone. But even as mobile devices replace the television at the top of the attention heap, the content is following. TV titans are redefining themselves as entertainment producers for all platforms: For example, CBS and HBO recently rolled out standalone online streaming packages, pitching a tent for their products in a mobile-dominated media future.